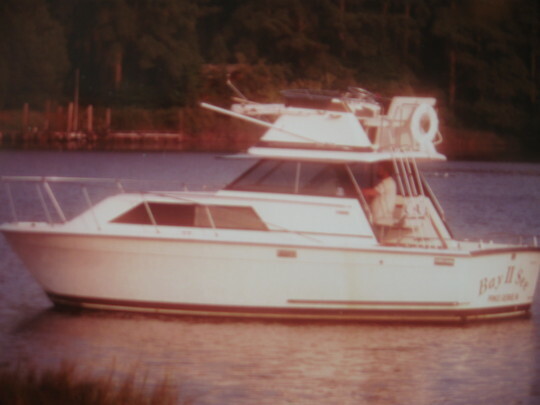 Dual control stations flybridge, all fiberglass including cockpit, nice teak Cabin with dinette. Galley has stainless sink, microwave, alcohol stove, and refrigerator, Settee for mid-berth bunk, Head with sink and shower. V-berth double bed, Bimini top, VHF radio, Depth finder, Stainless steel trim tabs, 14x17 Supercup props, Multi-zone battery charger. Galvanized fuel tanks are in good condition. Hull is in very good condition, boat will need to be hauled, cleaned and bottom painted. Gelcoat good, some chalking and hull structure and decks are sound. Original owner's manual. Not installed: AC/Heat pump, 2 new captain's chairs, and new waste disposal tank. Fresh water cooled Mercruiser 5.7L Inboard engines (non Vortec) with Quadrajet carbs on 1:1 71C Velvet Drive transmissions. All Removed from boat -- will need reman or new short blocks, heads can be refurbished. Other engine components -- carbs, intakes, distributors, oil pans, exhaust manifolds and risers, can be checked and re-used. Selling due to health reasons -- I can no longer handle the physical work this project demands. I will consider all serious, reasonable offers. This is a USCG Documented vessel.